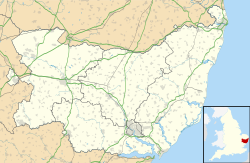 Royal Air Force Bungay or more simply RAF Bungay (known locally as Flixton) is a former Royal Air Force station located 3 miles (4.8 km) south-west of Bungay, Suffolk, England. Bungay airfield was originally planned as a satellite for nearby RAF Hardwick and was constructed by Kirk & Kirk Ltd., during 1942 with a main runway of 6,000 feet in length and two intersecting secondary runways, one of 4,220 feet and the other of 4,200 feet. In common with other airfields of the period, the technical, administrative and domestic buildings were dispersed to lessen the impact of any enemy air attack. The buildings were all of a temporary nature and the various sites were chiefly to the west of the airfield. The airfield was allocated to the Americans and transferred to the United States Army Air Forces Eighth Air Force and designated Station 125. Bungay was still unfinished when the Twelfth Air Force 428th Bombardment Squadron, 310th Bombardment Group (Medium) at RAF Hardwick arrived with fourteen North American B-25 Mitchell medium bombers in October 1942. The squadron moved on to Médiouna Airfield, French Morocco on 18 November 1942. A 12th Air Force film clip indicates that the 310th Bombardment Group was the first 12th Air Force group to fly the northern transport route from the United States to Europe and initially arrived at Prestwick, Scotland in October 1942. In December 1942, eight Consolidated B-24 Liberators of the 329th Bombardment Squadron, 93d Bombardment Group (Heavy) at RAF Hardwick were sent to Bungay to prepare for special intruder operations. These aircraft conducted raids in bad weather with the mission of harassing the German air raid warning system. The 329th flew these missions until March 1943 when they rejoined the 93d at Hardwick. Besides strategic missions, the group often carried out support and interdictory operations. It supported the Normandy landings in June 1944 by attacking strong points, bridges, airfields, transportation, and other targets in France. It aided ground forces at Caen and Saint-Lô during July by hitting bridges, gun batteries, and enemy troops. Dropped supplies to Allied troops near Nijmegen during the airborne attack on the Netherlands in September. Bombed marshalling yards, bridges, and road junctions during the Battle of the Bulge, December 1944 - January 1945. Dropped supplies to airborne and ground troops near Wesel during the Allied assault across the Rhine in March 1945. The 446th Bomb Group flew its last combat mission on 25 April, attacking a bridge near Salzburg. It returned to Sioux Falls AAF, South Dakota, during June and July 1945, being inactivated there on 18 August 1945. After the war, the field was transferred to the Royal Navy and the station became HMS Europa, being the satellite of HMS Sparrowhawk (RNAS Hatston) where three Fleet Air Arm squadrons were located. In 1946 it was returned to RAF control and was assigned to No. 53 Maintenance Unit RAF and became a maintenance sub-unit of No. 94 MU RAF which had its HQ at RAF Great Ashfield. Stored on the runways and in the buildings, were 250 lb., 500 lb., 2000 lb., and 4,000 lb. bombs, balloon cable cutting cartridges, depth charges, 7-inch parachute flares and German ammunition. The latter two items were eventually taken to 53 MU at RAF Pulham, and destroyed there. Some time in July 1949, the site was taken over by 53 MU until Bungay's closure in 1955. The airfield was eventually put up for sale and disposed of in 1961/1962. With the end of military control Bungay airfield was the location of the Martlesham Heath Parachute Club, with Cessna 182 G-ATNU and crop sprayers, including Pawnee D G-BFRY. In 1981-82, the Flixton Church Roof Restoration Fund held mini air shows. Until 1983, the main runway and peritrack were in good condition, but the following year work started on breaking them up. The former airfield is the home of 2 Sisters Food Group Buxted Chickens factory. There is also a large mushroom farm. In the early 2000s, Bungay's largest employer Clays, part of St Ives Group, failed to gain planning permission to re-site their printing factory on the airfield. ^ "Bungay". American Air Museum in Britain. Retrieved 2 Mar 2015. ^ "460th Sub-Depot". American Air Museum in Britain. Retrieved 2 Mar 2015. ^ "Quartermaster Depot Q_104". American Air Museum in Britain. Retrieved 2 Mar 2015. ^ "The 310th Bombardment Group". warwingsart.com. 2009. Retrieved 4 January 2012. ^ "Norfolk and Suffolk Aviation Museum". aviationmuseum.net. 2011. Archived from the original on 2 March 2011. Retrieved 4 January 2012. Wikimedia Commons has media related to RAF Bungay.